I can recall a time when people actually memorized other people's phone numbers. Yes, I know. I must be ancient. 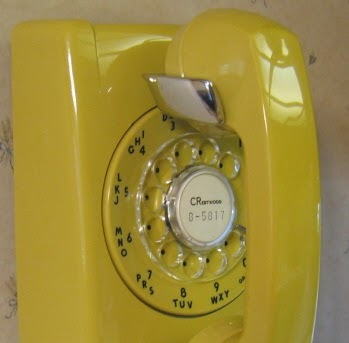 Back in the dark ages, before texting, before Skype, before facebook, email, and even before cell phones, yes, way back then, people communicated by calling each other on their "home" phones. They picked up the phone, and dialed a number. No one's name was programmed into the phone. Everyone memorized the numbers they called frequently, and if they didn't know the number, they looked it up in what was called a phone book. Families had only one number. To call anyone in the family, you called one number. Simple. Kids only had to learn one number. Doctors, teachers, soccer coaches, plumbers, grandmas--could all easily reach someone in the family with one number. If you remember living in a house with one of these, you are old. I have a nugget that will give you all of the benefits of having one phone number, and soooo much more. And it's FREE. You may think this nugget is not for you. You are single, don't need a "family" number, you've had the same cell number for eons, or you are one of the few who still have a home phone (which means you are over thirty). What if you could receive your voice messages in an email that you could save for future reference? What if your voice messages could be transcribed and sent to you in a text? What if you could hear the voice message before you decided to answer the phone? What if you could program your phone to immediately go to voice mail when certain people call? What if you could customize your voice mail greeting to specifically address the caller? For example, your boyfriend/husband calls, your voice message says, "Hi Honey, I'm having my nails done and really can't come to the phone right now, but I love you!" Brad Pitt calls and your message says, "Brad, please stop calling me. You've already cheated on one wife and now you have all of those children!" You can do this, and SO much more, with Google Voice. To watch a short video about Google Voice, click here: Google Voice. There are so many cool features and benefits to Google Voice (GV), that I am absolutely astounded that people aren't standing in line to sign up. Seriously. I really think that because Google Voice offers so many options, people think it's much more complicated than it is. Or, they just haven't taken the time to figure out how to use it. So I am going to do the work for you and make it simple. The first thing you will do is go to Google.com/voice, and sign up. It's very easy. You can select a GV number in your area code or another area code. Anyone in that area code can call you for free as if it were a local number. Or, you can make your cell number your Google Voice number, and then ask your cell provider to give you a new random cell number. This way you can keep your cell number forever, no matter where you move or what cell provider you use. And you will be able to get all of the cool GV features without ever changing your number. You can set up your GV account specifically and uniquely for every role you play in life. You can set up GV to ring both Mom's and Dad's cells at the same time when the kids/teachers/doctors call the GV number. You can even program a different voice mail greeting for each caller. GV will automatically email a copy of messages you receive from clients (or your boss) that you can replay, save to a file, or forward. This really comes in handy if, for example, you want a record of the message to double check an order, or if you want to take someone to court. You can set up calls to go straight into voice mail whenever your mother calls to nag you about not calling her. You can also set up your GV contacts in groups. You can set up specific ways of handling calls from each group just like you can with individuals. For example, all calls from customers could have a unique ring and voice mail greeting. All calls from extended family could have a different ring and voice mail greeting. Everyone in your book club, same thing. Another feature I love about GV is the ability to block calls from individuals or groups. Past lovers, ex-spouses, creditors, stalkers, solicitors, and your creepy cousin all can be blocked so that you never even know they called. You can even record a conversation (by law you must tell someone if you are recording the phone call). I know of many instances where this would really come in handy. Let's say a doctor calls with test results and you want to remember everything that was said. Or, perhaps you have to call someone who can be rather abusive. Or, if someone is going to verbally give you a big order and you can't find a pen to write it down because you are on the golf course/in the hot tub/at the spa. Or Brad Pitt calls again and you are sure no one will believe you. You can text from your GV account for FREE. If someone texts your GV number, it is FREE and will email you a copy of the text. International calls from GV are very inexpensive. You can even make calls from your computer without using an actual phone! So, what are you waiting for? You get one number to give out, voice mail, call screening, ability to receive calls on several phones, selective call screening, cheap international calls, personalized voice mail greetings, and free texts. And it's all free. Plus it's easy to set up. You'll thank me the next time an important client calls you and you are at the spa. Or with Brad Pitt. Note: To my international readers, Google Voice is only offered free in U.S. and Canada for calls within the U.S. and Canada. Calls to the U.S. and Canada from other countries using a computer are billed at .01cent per minute. Also, for those traveling from the U.S. to Europe, there is a way to use Google Voice with an iPhone or iTouch using only wi-fi (no expensive data plans). It is totally free and the quality of calls is excellent. I made calls home from Europe every day! If you want to know how to set that up, sign up for Google Voice, and then email me at AnniesNuggets@gmail.com and I will send you instructions.